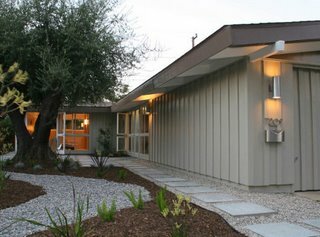 This mid-century modern home has been restored to its original luster and reflects the timeless beauty and function of the Cliff May design. Indoors and outdoors flow seamlessly and rooms are filled with light and fresh air. All original birch paneling has been carefully restored, and authentic touches such as boomerang Formica countertops and Western Holly oven and stove have been preserved to maintain the home's rich character. Upgraded features include a new roof with layer of insulation, new water heater, new VCT flooring, and upgraded bathrooms with Hakatai mosaic tiles and Grohe faucets. The kitchen has been opened significantly with reorientation of the refrigerator space, and lines for the washer/dryer have been run to the garage. The property has an expansive front yard that has been re-landscaped, and which allows plenty of room for a private pool or courtyard. This home sits within the Long Beach Ranchos Estates, a 700 home tract that was designed by renowned architect Cliff May and is bordered by the beautiful and grand El Dorado Park.